CHARLEY HULL, Georgia Hall, Charlotte Thomas, Bronte Law and Jodi Ewart Shadoff have four things in common. 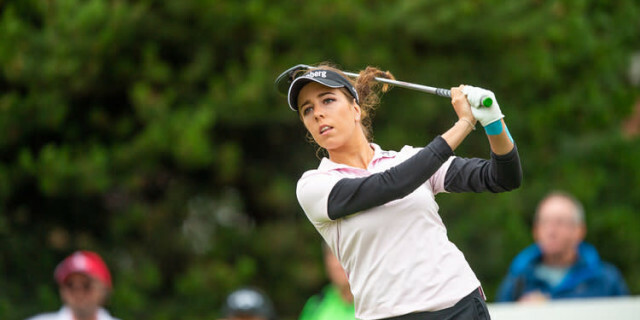 They are all English professional golfers, they are world class, they are all likely to make Europe's Solheim Cup team later this year - and they are all plying their trade on the LPGA Tour. And it is the final one of those facts that should concern us most of all. Sadly, we are unlikely to see very much of Hull and Hall on this side of the Atlantic during 2019 and although it is a great pity, it is hardly a surprise. Last year only 33 women earned more than £100,000 in prize money on the Ladies European Tour. It is fair to say that the LET was in crisis, with just a handful of tournaments and little or no prize money to speak of. And here is the conundrum. Increasing numbers of women are now playing the game at club level - it is the one consistent growth and stable area of the game. So why on earth is it so difficult for the LET to find sponsors, especially at a time when new money is being poured into the men's game in Europe? Nobody is suggesting for one moment that the powers-that-be are not working with every fibre of their being to attract new sponsors and keep the ones they have got, but with all our top players heading across the Atlantic, it becomes increasingly difficult to sell the product and convince would-be sponsors that their tournaments will attract big crowds - either in the flesh or on TV. And yet anybody who was fortunate enough to watch Georgia Hall win the Women's British Open at Royal Lytham last year (where in the flesh or on TV) saw one of the great performances by any British golfer, man or woman. Charley Hull has a huge following on and off the course. So we have two of the best golfers in the world but we are losing them to the United States. And, of course, the LPGA Tour continues to thrive with a full programme of tournaments and some very serious prize money to be played for. In 2018, an impressive 47 players earned more than $500,000, while 14 topped the $1m mark and Ariya Jutanugarn, the best player you may have never heard of, pocketed $2.7m. On the face of it, things have improved on the LET for 2019. There are 17 tournaments but the men have 47 on the European Tour, although that does include four majors and the WGC events. The LET's total also includes two majors, The Evian and the Women's British Open. And here's the thing. When you take a closer look at the LET schedule you realise that the TOTAL prize fund for most of them is less than £300,000. Trying to make a living as a professional golfer on any tour is not easy. You have to pay air fares, hotel bills and your caddie, but that is just for starters. There is the cost of getting to and from hotels and airports, together with the money that has to be paid out to coaches, biomechanists and psychologists, all of which seem to be compulsory these days. Just attempt to do that from on-course earnings of £100,000 and see how much you have left. People will point to lucrative sponsorship deals, but if you are Cloe Frankish earning about £30,000 for your year's endeavours then you are not exactly going to have blue-chip sponsors knocking down your door. Maybe we have to accept that this particular horse has already bolted. There has been much talk of a merger between the LPGA and the LET and if such a deal involved a commitment that saw the world's leading players competing in Europe then maybe it is something that ought to be explored. One thing is for sure - doing nothing is not an option. Could fully integrated mixed tournaments, such as the Jordan Mixed Open, be the future, which has a field of Challenge, Senior and Ladies European Tour players competing for the same prize?